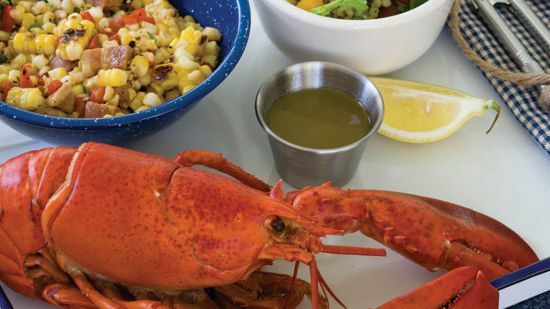 There’s been a fair amount of news about the unexpectedly low price of lobster this summer. Due to warming waters and, apparently, a whole lot of randy lobsters as a result, we are in the midst of a lobster glut. The current wholesale price for the things is about $3 a pound, give or take. While your local restaurant’s so-called “market price” for a lobster may not remotely resemble that number, retail prices are good in fish markets and grocery stores, and in Maine, where I visit every summer, they’re absurdly low. So what wine goes best with these happily hypnotizable crustaceans? (Seriously: If you stand a lobster on its head with its claws out in front, and stroke its back, it will just balance there, motionless, for quite some time. Excellent party trick.) To get an answer to that question, I stopped by to see Scott Worcester, who runs Sawyer’s Specialties, a bizarrely good wine store in Southwest Harbor, Maine; bizarrely good, because he stocks several hundred terrific wines in a town with only 1,700 people or so. This is very specific. For those who don’t happen to have an off-dry Chenin Blanc with four to five years aging in neutral oak barrels sitting by their elbow, he also suggested Chenin Blanc in general, as well as Grillo (a white variety from Sicily), and Chignin (an obscure white from France’s Savoy region). The key thing is that none of these suggestions feature new oak. People often suggest big, buttery Chardonnays as a partner for lobster, but in my experience oak and shellfish aren’t friends; if you do go with Chardonnay with your lobster, go oakless. And I’d also suggest Muscadet—as always, it goes brilliantly with anything that comes from the sea. 2012 The Curator White ($12) A blend of Chenin Blanc, Chardonnay and Sémillon from the talented South African winemaker Adi Badenhorst, this medium-bodied white has a juicy apple-ginger character. 2011 Feudo Maccari Grillo ($13) This Sicilian white is pineapple-citrusy and impressively crisp; a buy-it-by-the-case summer wine. 2012 Yalumba Unwooded Y Series Chardonnay ($13) From one of southern Australia’s oldest producers, this melony, full-bodied wine retains a lot of zippy freshness. 2011 Domaine de la Fruitière Muscadet Sevre et Maine Sur Lie “Petit M” ($13) Though it bears a lengthy name, this white isn’t heavy in the slightest—instead it’s lemony, stony, ebulliently crisp and light in alcohol. 2011 Denis et Didier Berthollier Chignin ($16) Chignin, a tiny subappellation of France’s Savoy region, is the source of this impressive, lemon-creamy white. 2012 Pascal Janvier Coteaux de Loir ($17) From an often-overlooked appellation in the Loire Valley that was once the favorite of King Henri IV (how can you argue with that? ), this surprisingly complex Chenin Blanc has a focused, minerally appeal.